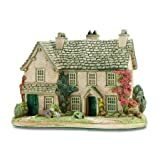 This beautiful hand made and hand painted miniature cottage from the world famous Lilliput Lane collection (and made in the Scottish Borders, not far from the Lake District) pictures Hill Top House, the first property that Beatrix Potter bought with the proceeds of her early books. Later, as her books sold increasingly well, she was able to become an important local landowner and to leave large areas of her Lake District agricultural estates to the National Trust, including this house which is open to the public. 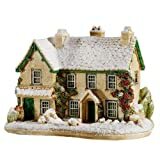 And here’s another Lilliput Lane figurine of Hill Top, this time without the snow.